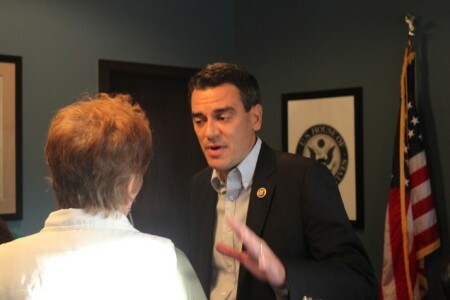 Rep. Kevin Yoder talking to a constituent during an open house at his Overland Park office in November. Rep. Kevin Yoder’s office announced today that it would be teaming up with the Kansas City Star to put on a town hall meeting with the four-term incumbent later this month. Yoder’s failure to appear at an in-person town hall for more than a year had drawn increased criticism from activist groups, who say he is dodging questions about his support for President Donald Trump and his votes in favor of the House bill that would have repealed and replaced the Affordable Care Act. The Star announced the town hall in an editorial published this morning, setting the event for 7 p.m. next Tuesday, August 22. However, the event will not be open to the public at-large. The Star will randomly select people who will be able to attend the event from those who register online. Yoder’s office and The Star will announce the location of the event at a later date. The Democratic Congressional Campaign Committee upped pressure on Yoder to hold an in-person town hall last week when it launched a website with a timer counting the days, hours, minutes and seconds since Yoder had hosted a town hall event. (His last in-person town hall was in spring 2016). Groups like Indivisible KC have invited Yoder to participate in in-person town halls in northeast Johnson County since Trump’s inauguration, but he has failed to appear. Yoder has, instead, hosted a series of “telephone town halls,” which his office says allow him to reach more people, but critics say insulate Yoder against having to answer tough questions since they are much more tightly controlled.